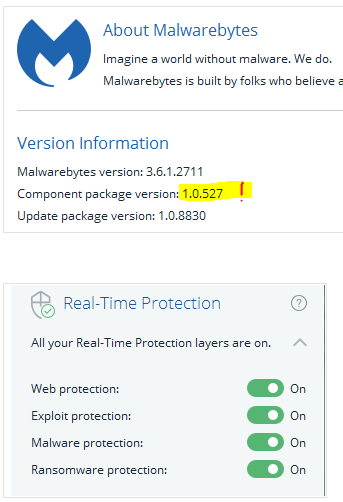 I do believe there's an issue with Avast's Web Protection conflicting with the Web Protection in the latest build of Malwarebytes 3 so it's possible that if you disable the web shield in Avast or the Web Protection in Malwarebytes that you'd be able to eliminate the issue until it is fixed. Late reply sorry. I re-installed Windows (7) and didn't have Malwarebytes installed, only Avast and I started getting the freezes again at desktop on boot and long pauses when doing various things. I switched to Bitdefender free and the freezing went away. The common denominator for me seems to be Avast so looks like I was wrong in my assessment that MB's was causing it. Although it did help the first time when I stopped it from running. That seems odd, as I don't use Avast, and all of my freeze up problems went away when I uninstalled Malwarebytes. I've had 1.0.527 installed since 7:30pm last nite. So far two separate sessions totaling 12.5 hours of use without a hard freeze on my desktop. Interesting, I guess Avast must have been having some kind of similar problem on their end around the same time as Malwarebytes. Thanks for the info. I guess it would be a good idea to check and see if users have Avast installed in the future once the fix for Malwarebytes rolls out officially to everyone if any similar issues crop up again. I started out running an early release of 1.0.527 last night with all Avast Premier shields disabled. Re-enabled this morning. No problems either way. This freeze has never been a conflict between MBAM & [any A/V Product]. The freeze happened without Avast installed (tested/verified ~Dec. 8 for Devin). While this is true for most cases, it is not true for all. Early on I verified that some of these issues were indeed due to a conflict (or at least due to the presence of another security web filter driver like the Web Protection in Malwarebytes) because many users were able to resolve the issue by disabling the Avast web shield or the web protection in several other AV products (Avira, AVG, and ESET for certain, and there may be others) allowing them to keep all Malwarebytes modules enabled without any further issues/freezes. Again, this is not the case for all, and I realize that, but it is true that it is the case for at least some. Just reinstalled MBAM Premium using Component package version 1.0.482 with the Auto update App Component settings turned off along with Web protection also turned off. I am not in the mood for a full windows image restore again. Now way in hell I'm doing any Beta testing or updating to a fixed component package release until I know for sure the freezes are gone with the wind. I'm thinking I may leave auto updates off all together, for ever and search for new updates to see if there are any issues with them before installing. Beats going down the road of wasted time chasing freezes and BSOD's. Avast free had nothing to do with the freeze for me and I still couldn't reproduce the freeze while using Win 7 on my HDD with package 1.0.058 with 1 week of use. Although I Beta test and use opensource software, I wouldn't Beta test something I paid for. Hats off to those that are Beta testing. You all should receive something for your kind service. About a minute passed after typing my last post and I Blue screened! Haven't had a BSOD since one of MB's dodgy updates last year. Oh well...Back to the drawing board. Really hope this is what caused my blue screen. When rolling back MB I forgot to exclude AVAST in MB.....ooops! And a recent Avast software update completely wiped my settings/exclusions on it. This is for all the MB and AVAST users(or anyone else in the know), is it necessary to exclude these paths In AVAST individually as well, seeing that they are located in the Program Files\ MB folder? I have been running with the Pre-beta ver 3.6.1.2711-1.0.527-1.0.8817 for over 24 hrs without a problem. All shields on. Bee running the BETA for about 26 hours now no freeze. 48 hours of NO FREEZING! Sorry i will wait till they sort this mess out before i go enabling web protection in CU 1.0.482 which is known stable. What i have just noticed is that it has been a long time where Windows 7 actually shuts down without a prompt coming up saying it is waiting for a program to close! Now i know without a doubt the program that was causing this is Malware-bytes Premium! I have gone easily a month now without windows 7 giving me the waiting for program to close prompt when shutting down windows or restarting. MBAM needs work and a lot of it i'm afraid. & all exclusion for Avast Premier in MBAM. I have always had those exclusions since the last avast/MBAM clash caused extensive issues. Please provide us the minidump file (and %systemroot%\MEMORY.dmp if it exists) so we can verify the cause. WeTransfer.com can be used to upload the files if you're unable to attach to a forum post. Might be another issue with your system, as almost nobody saw a BSOD with this issue... just a deadlock freeze. Have you run SFC (System File Checker) on it? Discussions about Windows 7 Reliability History caused me to take a peek at my desktop. According to the log, the machine was pretty stable until 09/19/2018 which is the date I installed version 3.6.1.2711 of Malwarebytes. Prior to 09/19/2018 I would have an occasional note on the history about Windows not being shut down properly. This error is related to an unknown application that was slow to close when I shut down the system. After 09/19/2018 errors related to mbamservice.exe start to appear in the history on a regular basis and after 12/06/2018, when 1.0.508 was installed, is when the hard freezes started happening. Same good results with the 1.0.527 install on my laptop. 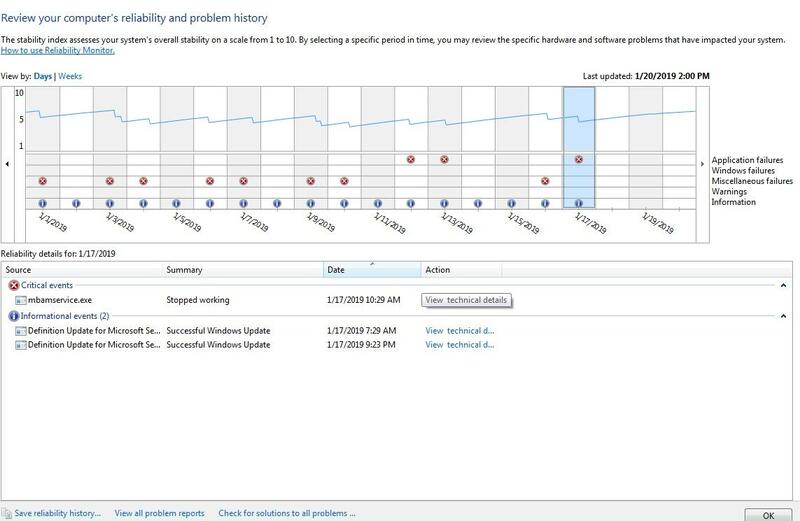 I've also noticed that 1.0.527 has cleaned up my Reliability History in regards to mbamservice.exe and Windows Shut Down issues. So far, so good running the 1.0.527 BETA build on 2x Win7 machines (Enterprise and Pro) for about 48 hours now ... doing normal activities (web browsing, YouTube, gaming, Discord, etc.) with freezes nor performance issues ... Auto Updates is turned on ... This is looking like a winner ! doing normal activities (web browsing, YouTube, gaming, Discord, etc.) with NO freezes nor performance issues.